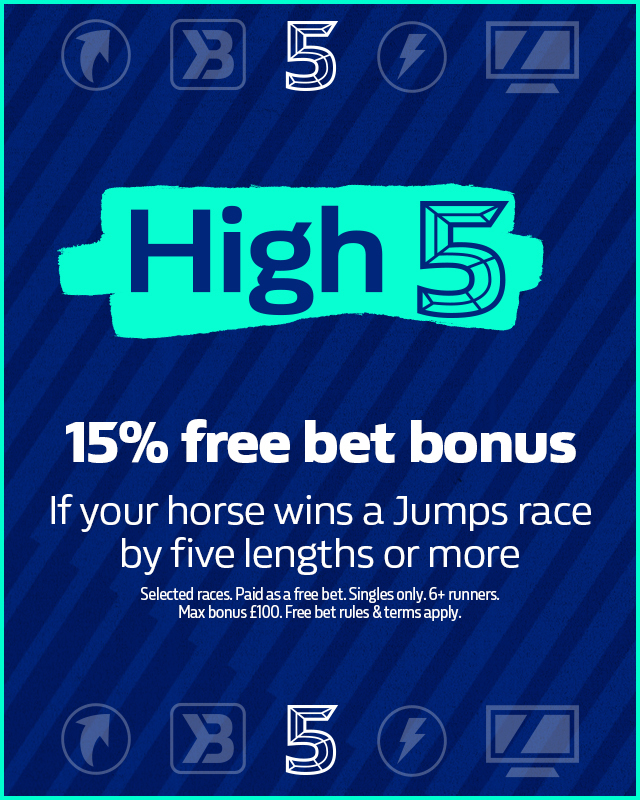 Jumps season is back – and so is High 5 – meaning William Hill customers will get a 15% free bet bonus when you back a horse that goes on to win by five lengths or more. National Hunt season has arrived, and as the colder weather approaches the world of horse racing is just warming up. We have an exciting schedule of winter racing in store, starting with Cheltenham and climaxing with the Grand National in spring. One in three jump horse races last season were won by five lengths or more, and William Hill paid out over 450,000 free bets to our lucky customers. Read on to find out how you can be a winner with High 5. You can use High 5 on any selected UK & Irish races taking place across jumps season, which will be announced by William Hill each day. That means you simply bet on a horse, and if it wins by at least five lengths, you’ll get a 15% William Hill free bet bonus on top of your winnings. High 5 is available to customers on all races with six or more runners at selected meetings – So more bonuses, means to celebrate with William Hill. Available on single bets placed on selected races containing 6 or more runners. Any Horse backed must win by five or more lengths. Maximum bonus £100 free bet. You can find all the best jumps season odds, markets and tips with William Hill horse racing, and we will be crediting plenty of bet bonuses along the way as High 5 returns for another season.